New documentary on Daniel Ellsberg makes a powerful argument, without ever saying it. Berkeley filmmaker Judith Ehrlich knew from the moment she met former US military strategist Daniel Ellsberg in 2000 that he could be the subject of a compelling documentary. At that time, Ehrlich was still working on her 2001 film about WWII conscientious objectors, The Good War and Those Who Refuse to Fight It. "Someone said, 'If you're going to make a film about WWII, you have to talk to Dan,'" Ehrlich recalled. "We took him out to breakfast, and he talked through breakfast. Then he talked through lunch. He talked until 3 p.m. I filled two legal pads with notes." Dubbed "the most dangerous man in America" by Henry Kissinger (the phrase would become the title of her film), Ellsberg is a fascinating character. He started out as part of the war machine — Ph.D in economics from Harvard, infantry commander in the Marine Corps, served under Secretary of Defense Robert McNamara at the Pentagon — and ultimately became a whistle-blower. His decision to release the top-secret Pentagon Papers in 1971 led to revelations of White House secrecy, an important Supreme Court ruling about First Amendment rights, and a role in the eventual downfall of President Nixon. He's the linchpin of an exciting period in US history, but he's also a fascinating character study. Ehrlich and her codirector Rick Goldsmith came in wanting to make a film about the Pentagon Papers, a 47-volume document that revealed how four administrations had lied to the public about their objectives in Vietnam. But they wound up making a film about a man's personal transformation. It was a smart move. The Berkeley duo had plenty of competition when they approached Ellsberg in 2004. Three other filmmakers were courting him (including Errol Morris), and it took the pair six months to convince Ellsberg that they were right for the job. The timing was fairly obvious. George W. Bush was elected for a second term as president on a platform that championed the Patriot Act, and he was escalating the wars in the Middle East. It was the year of Rovian wiretaps, orange terror alerts, and the revelation of torture at Abu Ghraib. Ehrlich and Goldsmith saw myriad parallels between that year and 1971, not only in terms of war abroad and government hawkishness, but also the "secrecy system" that Ellsberg breached. "This episode of history resonated so greatly with what was happening," said Goldsmith. "We were in a war in Iraq that we had been lied into. We were then in another war in Afghanistan." Politically, Ehrlich and Goldsmith were on the same page, though they had slightly different ideas of how to frame their story. Goldsmith was more the investigative journalist. He wanted to telescope the story by having a third-person narrator — the type you'd hear on any PBS American Experience documentary. To have Ellsberg tell the story might compromise its believability, Goldsmith worried. 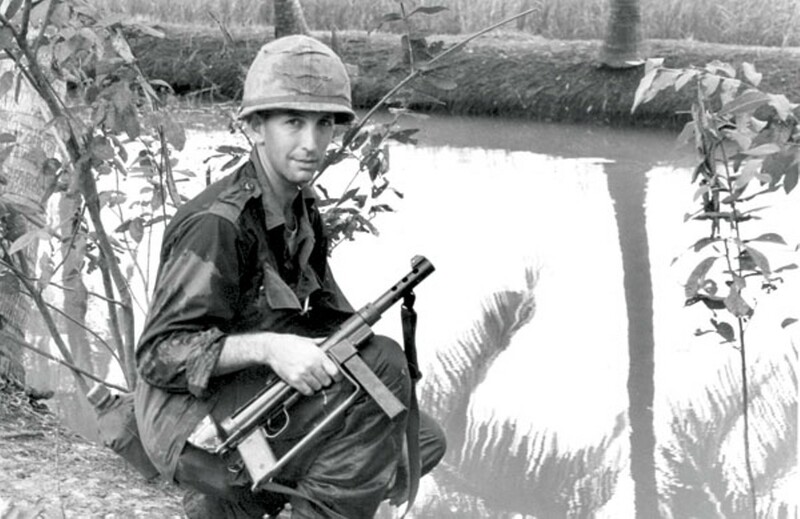 It wasn't until after they started melding the different elements together — Ellsberg telling the story of being in Vietnam and getting fired at, Ellsberg's anguish over biting the administration that fed him — that the "neutral narrator" voice started to sound jarring. "At a certain point," Goldsmith said, "it was like, 'What is that person doing in the film?'" Thus The Most Dangerous Man in America became more character-driven, with a definitive moral compass. The directors devised it in three parts: Ellsberg's conservative period; his subsequent change of heart and decision to leak the Pentagon Papers; and the aftermath, both personal and political. Initially, we see him as a thoughtful but impressionable young conservative. He's a military analyst and staunch proponent of the Cold War, out to save Vietnam from what he perceives to be a Stalinist dictatorship. In 1964, he reported the Gulf of Tonkin incident to McNamara and helped justify Lyndon Johnson's decision to ramp up the war in Vietnam. But when his father fell asleep at the wheel, causing the car accident that would kill Ellsberg's mother and sister, then-teenage Ellsberg realized the fallibility of his superiors. That notion would later allow him to be skeptical of Johnson and McNamara, and realize the sharp disconnect between their pro-war rhetoric and their private doubts about the chance of ever winning. The real turning point happens when Ellsberg, still a Pentagon insider, meets Randy Kehler, a 25-year-old draft resister who decided to go to jail instead of fighting the war in Vietnam. Ellsberg had never realized that someone could choose incarceration over complacency. Ultimately, he makes the same choice. He was already somewhat of a peacenik by the time he left the State Department to join the RAND Corporation in 1967, and begin working on the Pentagon Papers (which began as a McNamara study on US decision-making in Vietnam). Kehler brought him all the way over to the other side. In the film's most dramatic moment, he recounts the story of sneaking into the office at night to photocopy the 7,000-page document. He enlisted his son to help photocopy and his daughter to cut the words "Top Secret" off of each page. It's gripping. After Ellsberg leaks the Pentagon Papers to New York Times reporters Neil Sheehan and Hedrick Smith, the film ceases to be about one man's crisis of conscience. Instead, it's about a whole bunch of people getting tapped on the shoulder and asked to take a huge risk. There was no precedent for this type of leak, so no one knew the legal ramifications. Given the dangers, Sheehan, Smith, and their editor, Max Frankel, chose to run the story anyway. The Times' in-house lawyer James Goodale risked his job by telling the paper to keep publishing, even after the White House issued a federal injunction. Ellsberg's former RAND colleague Tony Russo faced jail time for refusing to testify against Ellsberg. Despite that critical mass, Ellsberg was unhappy with the outcome. In a 1972 radio interview, he seemed despondent that the Pentagon Papers leak hadn't immediately shifted the tide of public opinion. "He's a very optimistic guy," said Ehrlich. "I think that was his darkest moment, when he realized it wouldn't stop the war tomorrow morning." Indeed, the consequences of Ellsberg's actions wouldn't be felt until years later, and many of them would be individual rather than societal. The film's most poignant shot shows Ellsberg at an antiwar rally in 2008, years after he transformed into a consummate peace activist. (That part is implied rather than overtly stated). Two police officers are helping him into a paddywagon. His wrists are bound in plastic cuffs. That's the moral core of The Most Dangerous Man in America, Goldsmith said. He admits that it's not a story with two sides. We know what eventually became of Nixon, and Ellsberg's trial has a clear moral trajectory: It's one man's stand against government corruption. Yet, by merely revisiting Ellsberg's act of civil disobedience, Ehrlich and Goldsmith find ways to make the story fresh. Somehow they avoid mentioning subsequent wars or presidential administrations, but make it easy to connect the dots. The Most Dangerous Man presents a compelling argument without ever saying it. And that's where it succeeds. "To us, the 'side' is what happens when you — you or me, a twenty-year-old, a fifty-year-old, a government employee, or anyone else — is faced with a choice," said Goldsmith. "I can go along to get along, or I can take a risk."